Inventory may be exported to a number of third party companies, including Carsforsale.com, AutoTrader.com, and Credit Acceptance Corporation. 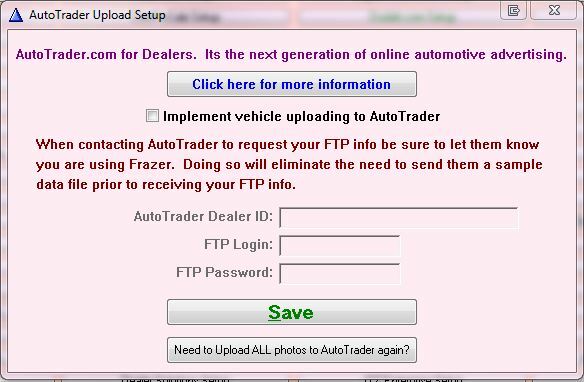 A tool to help a user post to Craigslist is also included in the Frazer Program (see Post to Craigslist for more information). In most cases, a data file and photos will be included in the upload to each third party. 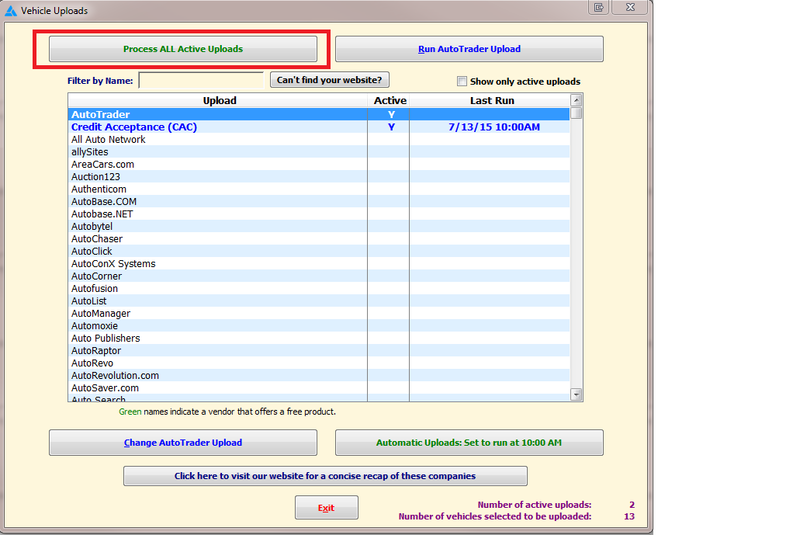 To set up the vehicle upload feature, go to then click on . This option is also available through Vehicles >> 8 - Vehicle Uploads and Miscellaneous >> 1 - System Options >> 5 - Vehicle Options. Scroll through the third party companies, and click change upload to activate uploading to this company . Enter the requested information (provided by the third party directly to the dealer). Then click . If uploads are sent to multiple companies, do the same for those vendors, as well. Once activated, your active uploads will appear at the top. To send the inventory file and photos for a single vendor, highlight the vendor you wish to send your inventory to. Next, click on the top right button. This will only run the selected upload, while the button on the top left will run all of your uploads. The information will be sent via FTP (File Transfer Protocol) to the server of the designated company. At some point, the third party will retrieve the file and photos for processing to their website. This may happen within minutes or hours, depending on the company. 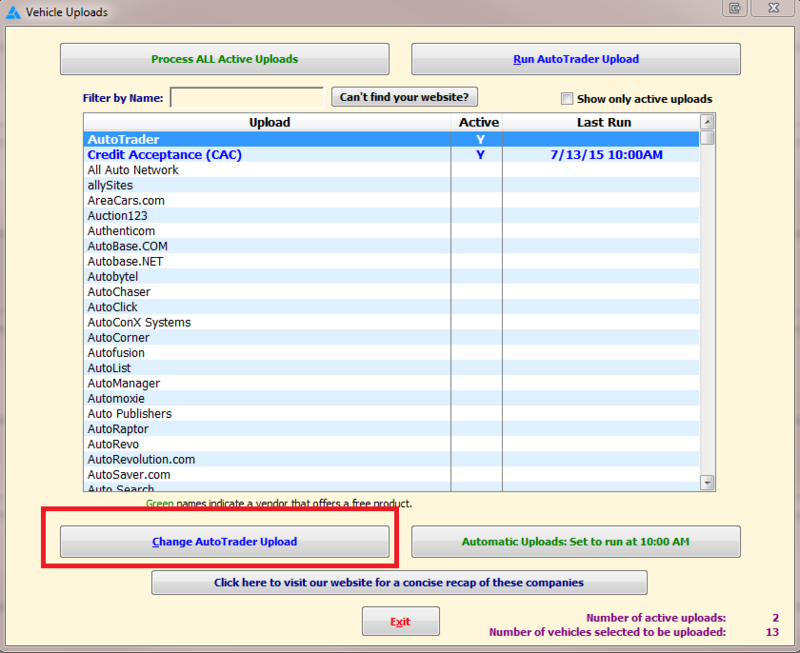 To schedule or change your automatic uploads, click on Enter the time each day to upload to all selected websites. The upload will occur daily at the scheduled time whether Frazer is open or closed, just be sure the main computer is turned on. To be sure that vehicles are included in the uploads, go to . The last column visible on the screen is U for Upload. If a Y is visible, the vehicles are selected to be included in uploads. To change this option, select the vehicle to exclude, then go to the Sales tab. Un-check the box to Include this vehicle in any uploads to a web site. To include the vehicle in uploads later, go back to the Sales tab and check the box again. The program is defaulted to mark all vehicles for inclusion in vehicle uploads. To disable this default, go to >> 1 - System Options >> 5 - Vehicle Options >> and uncheck the box. Going forward, when adding new vehicles to inventory the box will be unchecked unless designated otherwise in each individual vehicle.